I know a lot of fellow bloggers are in the midst of learning about SEO. If they want free traffic from search engines, they really have little choice. Google isn’t quite at the level that you can rank well without having at least have a clue about what you’re doing. The problem is that there is so much info out there that no longer applies or was just unproven theory/assumptions. So this week I’ll try to clear the air about one area of misinformation. Now let’s talk about what you should be avoiding when building links for your blog. For a long time now Google has used a blog or website’s backlinks as the primary factor for determining how high they should rank for different keywords. In the past every link you acquire would have the potential to help, but now Google has shifted more towards quality over quantity when it comes to judging a backink profile. I have actually recommended directory submissions in the past, but that is just the nature of SEO. What works today might not work so well tomorrow. This is not to say that all web directories are not worth the time, but these days there are relatively few web directories that will help your SEO. It makes sense if you think about it. Most web directories do not have particularly strong backlink profiles, yet they link out to thousands and thousands of websites. With that kind of setup there isn’t a whole lot of PR or ‘link juice’ that can be sent to each website. To make matters worse, the majority of submissions use the exact same site description that they used on a ton of other web directories. So gone are the days that you can submit to every web directory you can find and get a significant SEO improvement. Instead you’ll want to focus on niche specific directories and well established directories with solid stats. For example with a finance blog, you might still find decent benefits from getting listed in finance specific directories as well as blog directories. Some of the more established directories do require that you pay a submission fee in order to weed out the spam submissions. Just don’t assume that every paid web directory is worthwhile. Many of them are a waste of time too. For a while submitting to article directories was the link building strategy of choice of a vast number of SEO pros. Back then you could submit a single article to hundreds of article directories. If you were lucky other websites would also republish your articles, creating even more links. When search engines cared a lot about link volume, this tactic was priceless. Most article directories had the same problem as web directories – weak backlink profiles and a ton of external links. With the increase in popularity of automated submission software, the problem quickly became exponentially worse. In the end, each article was far too diluted to have much benefits. Since all of the lower end article directories didn’t have any unique content, Google actually started cracking down on them more. After the dust settled, there were only a handful of article directories that were still beneficial to submit articles to. Still, with countless SEO spammers continuing to blast away articles to these directories, your articles are unlikely to be seen by anyone. Your links get buried too quickly to get good SEO benefits either. Because link volume was previously so important for SEO, it was only natural that people would try to find shortctuts via automated software. Why spend days on end manually building links when you can use software to create the same effect? With a few clicks of your mouse, your link could be spread across tens of thousands of websites. The more advanced software even tried to make it look more natural by spacing those links out over several days or weeks. The big problem with this strategy is that you can usually only create low quality links using automation. As Google started phasing out the importance of link volume, these automated ways of creating links went the way of VHS videos. Just like with VHS, there were people who kept using them. In the case of automated links, it was Yahoo and Bing where those strategies may still work. The thing is, it’s not worth risking things with Google in order to get a bit of secondary traffic. I do acknowledge that I haven’t used any automated link building software recently. There very well could be software that is still worth using. I probably wouldn’t try using the ones that automatically build links anymore, but they can be useful for helping locate potential link opportunities. I touched on this in a previous post about the importance of anchor text variation. In the past you could get away with building all of your links using a single keyword phrase. To the search engines it looked like your site was extremely relevant for that keyword. Eventually Google caught up and acknowledged that this situation looks very unnatural. If a website really was genuinely relevant for a specific phrase, they should naturally get links with a wide variety of link anchor text. If the site was particularly trusted, they’d probably get a lot of links using branded keywords. This is the other part of why strategies such as article directory submissions lost effectiveness. Unless you made a point of mixing up the link anchor text with every submission, you’d end up with very unnatural looking anchor text distribution. 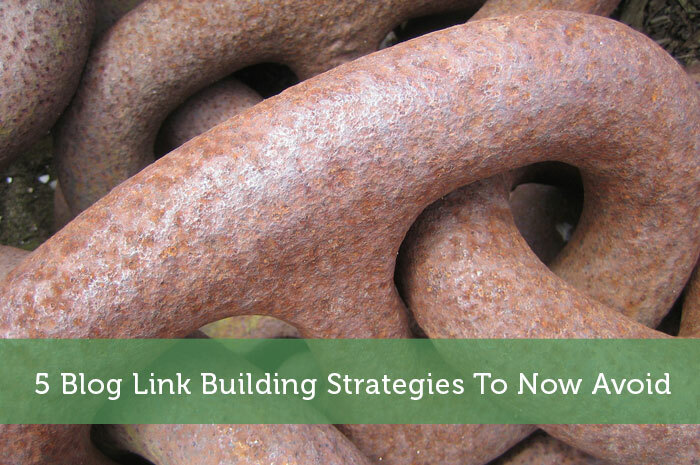 In today’s SEO landscape, you want to make your link building look as natural as possible. If an exact anchor text is used for too high a percentage of your links, don’t expect Google to be very accepting of that. Yes, I said blog commenting. Some of you may be panicking a bit reading this as I know lots of bloggers use commenting as their exclusive link building strategy. Ok maybe you shouldn’t straight up avoid blog commenting. It does serve other purposes beyond SEO. Just don’t expect it to help your SEO link building efforts. With blog commenting you can generate substantial direct traffic with your comments, especially if you are commenting on a popular blog or one that is very relevant. Also it can help build connections with those bloggers and show more of your personal side. When it comes to SEO though, the links that you get from comments are very low value. You’ll find that a lot of blogs have comments set to use nofollow links. That means the links won’t pass PageRank or SEO benefits. The exception would be the blogs that do use dofollow links, particularly the ones that have dofollow links in plugins for recent comments or top commenters. Those can give you high PR links, but they are usually short lived. The list above is just a sample of link building strategies that are not as effective as they once were. If you’re going to spend the time trying to build links for SEO purposes, be sure you are not wasting time on outdated strategies. Take the time now to do sufficient research so that you are helping your SEO today and tomorrow. If you do come across a link building strategy that sounds promising, check when that article was written. Also check for recent articles about that strategy. In the ever changing world of SEO, you need to make sure you’re not following outdated tactics. What kind of link building strategies do you focus on? Is SEO or direct traffic more important to you? Looks like you can add Press Releases too since most are (or should be) going no-follow. Still good for traffic, but not SEO. Yeah I considered including press releases but figured most bloggers don’t take advantage of that. Google did specifically warn about keyword links in press releases. So I’d think that naked url links would still work for now. Good post Jeremy! Timeliness can be such an issue with this, especially when you take the always changing whims of Google into question. When you search for stuff on SEO, so much of it is outdated and should be discounted many times. Getting the direct traffic is nice, though I tend to be more focused on search and just try to be as diverse as I can be. Diversification is important to create more stable search engine rankings. The people who chase direct traffic will be tied to those strategies perpetually with constant effort required. The people who focus on SEO will gradually build up a much larger stream of traffic that requires less work in the long run. Nice article. Thanks for posting, as SEO is one area I’ve not really focused on in my blog. It is an intimidating area to focus on early on, but since it is so important, you can’t ignore it for too long. That can hurt me, blog commenting is the only thing I do when it comes to SEO. Maybe, I should focus on other things now, do you have any recommendation for me? People like you is exactly what this post is for. I suggest you keep commenting, but gradually shift focus more to the blogs that are sending decent traffic and the ones that seem like they would be willing to link directly to your blog in a post or blogroll. Also shift more time to social media as that can create powerful SEO signals. I’ll try to cover some other link building strategies to use in an upcoming blogging tips post. I would definitely do those. Thanks Jeremy! I’d just try to be as “natural” as possible. While it would be lovely to have a quick and easy link building strategy, it sometimes boils down to outreach efforts and posting valuable content to your blog that at least adds to your keyword strategy. Something I’ve noticed in the blog community that is really lacking is the use of proper meta descriptions, title tags, and H1s. In some cases, I’ve seen people with their title tag the same as their H1. For next steps, I recommend people focus on their social sharing, which will feed into their backlinks. Namely when I push the “share” button with plugins like BufferApp, it should autofill your Twitter handle. I’ve had to look up EVERYONE’S Twitter handle before I post your articles. That’s no good. There’s no interaction there and I’m left to decide if I want to tag you or not. Good points Kretek. I agree that many bloggers don’t pay proper attention to the onpage elements you mentioned. It’s really a missed opportunity, especially the ones that don’t use keyword targeting in their titles. Social media really is a better area to focus your time than commenting, but some bloggers may be hesitant as it isn’t as simple as filling out a comment form for a link. Sorry but I had to laugh at your comment Michelle since you have always been the most active commenter I see around. I think if you truly loved to comment, you might be leaving longer comments rather than focusing on getting on as many blogs as possible. I do see that your commenting has led to getting other higher quality links which is great. You have done a pretty good job with your SEO so far. Great overview. I’m still very new to the whole SEO landscape, so any information is good information for me. Links are a very interesting part of SEO so thanks for the details. No problem Jake. Most bloggers do seem new to SEO, but really it is such an important aspect of blogging that cannot be overlooked. Definitely some good information and food for thought. Glad you enjoyed it James. thanks for the tips! It’s strange how the SEO strategies change over time.. hard to keep up! No problem Tianna. If the SEO strategies didn’t change, the spammers and aggressive marketers would inevitably rise to the top. So all the changes are really just a way for Google to fight back. Thanks for the post mate. I don’t know much about all these directories. I know in terms of commenting it gives me more of a way to network with blogs I follow and if their fans read a post that I left they may head over to check me out. I think there was a time when I thought it helped SEO but later learned that’s not the case. Besides, I’d rather comment because I want to not just because I think I have to. Commenting does have all kinds of other benefits, but I wanted to clear up the air about it not being very beneficial to SEO. Many people seem to have that misconception. SEO is something that I’m gradually learning about. I find that there is so much information out there on SEO, it’s difficult to know where to start! I do use blog commenting for networking with other PF bloggers so I’m not too worried about the link building aspects of that. I try to use keywords in my posts but I’m not sure I’m using them properly to be honest! Link building is definitely an area I need to improve on. All of that SEO information out there can be both a blessing and a curse. It’s great that it’s readily available, but the amount means that a lot of it is not accurate or is now outdated. Networking with bloggers early on is important, but for even quicker growth, you should be focusing on SEO too. I think commenting is so valuable for building links because it helps you build a relationship with the blogger, who then in turn is more likely to link to you 🙂 the comment itself is most definitely not valuable though. Those extra benefits really depend on the blogger too. The newer blogs that are still in their early growth stages will be a lot more eager to link out, but eventually they do tend to be a bit more careful for more long term potential. So if you’re commenting for that kind of benefit, it’s something to consider. Very interesting article. Pretty new to all this stuff so it’s always nice to learn something new. Like some posters have said, I’d like to try to balance between naturally progressing traffic while also trying to actively build traffic through various other means (social media, commenting, etc). SEO is something still a bit foreign to me, at least in terms of how to effectively utilize it. Your post makes me want to learn more about it so I’m sure I’ll end up spending some time looking into it. Thanks for the post! Some of my previous posts in this series might be useful in that case. It sounds like you’re taking a good approach, but you might want to mix in some other ways to go about getting links and focus a bit more on that side of things. Again, thanks for another installment. I certainly notice more traffic from commenting,so even if there is no SEO benefit, I think it help with a newer blog, at least in the beginning. I’m still learning the other strategies, and it is frustrating how it changes all the time. I think I have to just do what I do and let the rest come along as I learn more and get more efficient. There isn’t necessarily a rush to learn everything, but the sooner you do, the more effective you can be with your marketing. There’s no doubt that commenting will help with traffic, but since it’s like turning a tap on and off, it’s not too practical if someone wants to build long term passively generated traffic. That seems to be Google’s goal, but the aggressive marketers are bound to figure out the secret to manipulating the current SEO landscape too. Just waiting for natural links is rather impractical. First thing first if you want to drive your traffic successfully you have to read the Google Webmaster guideline, then be aware on Google algorithm updates, Old link building methods are useless like what we were doing before we just built links as many as we could but now even if you post a few, then you know are relevant then go for it, just might work! Couldn’t agree more. I think since most people’s search traffic is from Google, then its only prudent to read the webmaster guidelines and pick a few things to work on. All things in moderation. Most of these were outdated a long time ago. I still use some of the quality niche directories and things like DMOZ, Yahoo etc but not for linkbuilding. Commenting like you stated is a great source for getting people to notice your brand. The more they see you and the better advice you give the better chances you have in gaining new readers. I am working on the mixture of SEO, referral, and direct traffic. Think is just best not to depend on no one source. Very true…you don’t want to just rely on one traffic source, even if it does seem to be doing quite well. You never know when that source might dry up or when another source might take off. I would say SEO is more important to me, because I write more for search engines than a daily audience – I think it’s hard to do both. I’ve never thought of blog commenting as a way to build links, but instead as a way to build connections and get some direct traffic via the link in the comment. That is interesting that you write more for search engines. I wouldn’t say you can’t do both though. The very best content satisfies readers and search engines at the same time. The toughest part about that might be writing catchy titles that still have your target keyword featured prominently. I used to run a blog dedicated to selling a single product, after a few months of writing content and building links I was receiving around 100 hits per day – not much in the grand scheme of things, but it was enough to be making a sale most days. Then one day the site simply plummeted in the Google search results and I dropped to only 2-3 visitors per day. The main reason I think this occurred was not varying anchor text, but also I think that there was not enough variance within my post topics – unfortunately running a site about a single product made it quite hard to branch out. The main lesson I learned though was to not rely on any single traffic source too much. Google may change how they view your site, partners may remove their links, but as long as you have diversified your traffic(much like building an investment portfolio!) you won’t hit the same roadblock I did. Yes trying to blog about a specific product would be way too tough. Blogging wasn’t really meant for topics so limited. With that blog you very well could have over-optimized the anchor text as you’d probably be focusing so heavily on that product name rather than words describing what that product does. At least you were able to learn some lessons from that blog. Sometimes you learn more from failures than you do from success. Jeremy this is very insightful. Would you say your points also apply to blog “carnvials”? It’s tough to say. Technically it would be considered a link scheme, but it may still be relatively safe. Since it is not a particular popular strategy beyond a few blogging niches, it is unlikely that Google will have carnivals on their radar as something to specifically target. Thanks for all these helpful posts. As a total newbie to this SEO stuff, even if I don’t succeed with it in my own blog, I work in non-profit development and work hand in hand with marketing and websites so it’s really good to know this information in my professional life as well! Sounds like good incentive to learn quicker. I’m sure you’d want to get them extra traffic and donations if you can. Good points Jeremy. I remember reading Pat Flynn’s Smart Passive Income first Niche Site Duel and thinking that article directories, Web 2.0, and all that stuff was the way to go to build links if you want your site to rank Number 1 for the keyword you chose. Good thing I wised up. A lot of that stuff just doesn’t cut it anymore in today’s landscape. The more I learn about SEO, the less fancy I try to be. Really I just stick to the basics now when it comes to link building for all my sites and there is substantial proof that it works just fine. That’s the problem with almost any SEO or Website Marketing book. By the time it’s all written and published, strategies they mentioned become obsolete. It’s just one of those niches that websites are a much better medium to learn from. Love this series. Thanks, Jeremy. No problem man. Glad you enjoy it. I think natural will win the race in the long term. Almost all automated methods will be discovered and penalties applied by Google. The question is how far into the long term does the natural approach take. If it will take a long time it is still likely worth mixing in some artificial links to benefit now too.